According to Pierre de Coubertin in 1913, the five Olympic rings were destined to become an « international symbol » . A « light, colourful and spiritually lifting » flag that did not stop the terrible battles of WWI that began the following year, but could come to symbolise the hope of a unified and peaceful world. Sweep away the past ! From the stadium in Olympia to the first Winter Olympiads in Chamonix, in 1924, the road was long and studded with the greatest of ideals, but also great problems and terrific battles. The true history of the Olympic Games. Equality and fraternity, two republican values that also apply to the Olympic ideal. The new beginning of the Olympiads, proposed as early as 1797 by humanist teachers, was based on democratic, educative and cultural values from the Age of Enlightenment that provided the games with a dimension running well beyond the simple sports competition. 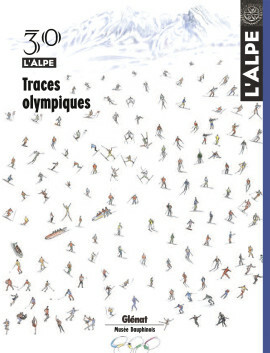 A map never before published of all the past and candidate sites for the winter Olympics and Special Olympics in the Alps. With a second map of the past and candidate sites for the winter Olympic games throughout the world that contains some surprises. Portfolio – Shall we danse ? The opening ceremony of the Games in Albertville is still widely remembered due to the boundless creativity of Philippe Decouflé and Philippe Guillotel, two young artists virtually unknown at the time and who happily blew to smithereens the tiresome clichés generally associated with the event. Ski equipment and techniques have undergone rapid change in a little over a century. Skiing, previously a simple means of transport over snow, has become a recreational activity combining pleasure, performance and fun. A major shift that is largely due to the competitors of the Olympic games. Skating, bobsleigh, luge, hockey and curling are the Olympic ice sports. Similar to skiing, the development of these disciplines depends not only on the equipment and techniques, but also on the quality of the frozen surface on which the competitors slide. This apparent paradox is confirmed here. Formerly a physical difficulty for mountain inhabitants, slopes are increasingly today a simple spot for the recreational activities of urban dwellers, for which the Olympic games are a paroxysmal example. A complete inversion in values that turns mountains back into a feature of the landscape. The Olympic infrastructure in the resorts hosting the winter games has followed the major developments in architectural thought. From the palaces in Chamonix to the restructuring of Sestrières and the outright creation of Squaw Valley, a brief history of a century of construction in the mountains. An equation with many unknown factors, the management of a winter resort has become most difficult for operators. Highly dependent on social change, the many aspects of a resort must be combined and balanced to reconcile the demands of tourists and daily life. Few writers have expressed fascination with sports, performance and athletes. Here an anthology of texts that, centuries after the Olympic odes of Pindar, celebrate or question the value of sports and the Olympics. Lovingly restored, reinforced and framed, the thousands of posters collected by Michel Couasnon speak volumes on the relations between art and the Olympics. A treasure trove well worth a museum ! A presentation by the collector himself. In Albertville, the Maison des Jeux olympiques d’hiver proposes a museo-graphic presentation that attempts to clarify the complex relations between winter sports, mountain territories and the Olympics. Included are historical aspects, events in 1992 and temporary exhibits well worth the trip. In February 2006, the winter Olympics will be organised by Turin. In Europe, it is rare to see such a large city (over a million inhabitants) located so far from the Alps organise the winter games. It must be said that the Piedmont has always had very complex relations with its mountains. Banned from the games for decades, handicapped persons are confronted with precisely the same motivations as athletes. The paradox is that the celebration of the ideal body long contradicted the Olympic ideal of equality. By integrating handicapped athletes, the Olympic movement finally accepted differences, but not necessarily the notion of « otherness ».